Steamed sponge cake is a simple dessert with only a few ingredients needed. 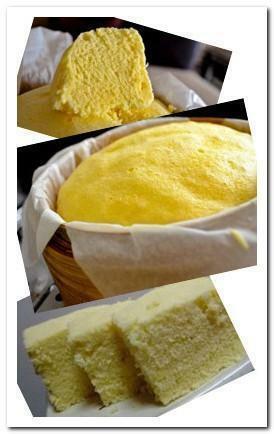 The cake is fluffy, spongy and with good smell of egg aroma. It is very nice to serve this with coffee or tea. It is a lovely snack any time of a day or serve it during breakfast. Eat warm or cold, both are delicious. It can be reheated easily by steaming or microwave. Prepare an 8 inch cake pan, line with parchment paper. Boil water in wok, set steam rack ½ inch over water. Meanwhile, use an electric mixer, beat eggs and sugar with high speed for about 10 minutes or until the batter become thick, creamy and pale in color. Gradually fold in flour with spatula, mix until no lumps and the batter is smooth. Pour batter into cake pan, steamed at high heat for 20 – 25 minutes or until an inserted skewer come out clean. When steaming, watch water level closely, top up with hot boiling water if necessary.